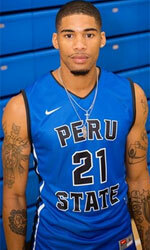 Amistad Sucre (Libobasquet) landed 25-year old American forward Luther Page (201-100kg-93, college: Alabama State). He played in the summer at Belmopan Red Bandits in Belizean NEBL. In 10 games he averaged impressive 19.3ppg, 9.1rpg, 1.3apg and 2.2spg. 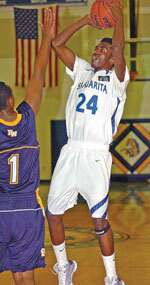 It was a very successful season in his career as he was selected to Belizean NEBL All-Star Game. The last season Page played at Darkhan Garid (Superleague) in Mongolia where in 13 games he had very remarkable stats: 15.7ppg, 9.5rpg and 3.1apg. Page's team was regular season runner-up in SWAC in 2015. He has played also professionally in ABA (Chicago Steam). Page attended Alabama State until 2015 and it will be his fourth season in pro basketball. Let's have closer look into His outlook: Strength: Luther Page has good size for a combo forward. He uses his strength to post up and over power smaller defenders to score. He also has the ability to take bigger more physical defenders off the dribble. Luther uses his strength to power through defenders and to finish through contact. Luther displays good mechanics on his jump shot and has range that extends to the three point line. Luther has a high motor and he is always active which allows him to be an exceptional defender and he uses his long arms to get deflections. Luther has a high basketball IQ and he is able to adapt and adjust his play to fit opposing defenses. Weakness: Despite having an above average jump shot, Luther often settles for drives to the basket that leads to a more difficult shot. Luther needs to improve on his explosiveness and overall athleticism to help him get more rebounds. Luther might need to become more aggressive and assertive on the offensive end. Overall, Luther is a solid prospect who needs to continue to improve/polish his skill set.